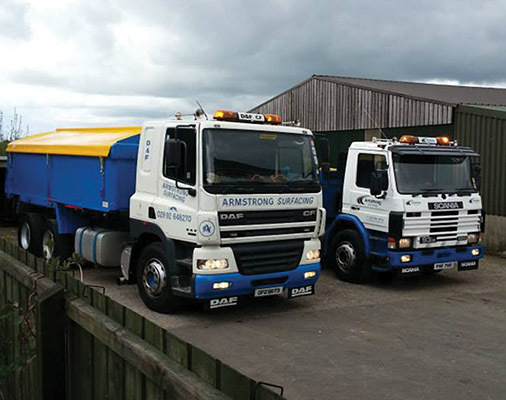 Lisburn based Armstrong Surfacing (also known as Robert Armstrong) has been supplying a service to the people of Northern Ireland since the early 1900s. These days this family run business specialises in the laying of asphalt and brick paving along with numerous other services that include hard landscaping, coloured pebbles, spraying and sealing, kerbing and drainage works, car parks, shop forecourts, civil engineering works, building sites, site preparation, laneways, driveways and utility work and patching. However, when the Armstrongs first went into business, it was in the quarrying industry when John Armstrong began to supplying sand and gravel from their Whitemountain quarry to local customers. When the quarry was then sold to Lagan, it could have been the end of the Armstrong business, but three generations since John first began the business and the family name is still going strong today. John handed the business to his son Robert who in turn passed it on to his first born Robert and now the latest generation sees Robert’s sons Richard and Robert Jnr look after the day to day running of the business. “The name Robert is very prominent in our family alright,” joked Robert jnr who spoke to this month’s edition of Irish Trucker about the services that they provide. Robert revealed that they offer a turnkey service in that they will go in and do all the work from start to finish i.e turn a green field site into a carpark. Working in conjunction with the customer is something that Armstrong Surfacing has always prided itself on. “Being a family run business, we understand that each customer is unique with individual requirements. We offer free quotes and work closely with them from consultation to completion of work; ensuring their satisfaction at all times,” added Robert. The company has seven employees and all are highly trained in what they do, ensuring customer satisfaction on every job that they complete. Armstrong Surfacing are proud to be one of the leading surfacing companies in Northern Ireland and their customer base covers the private and public sectors. “A lot of our customers would be with us year and we would have a lot of repeat work from them. Of the projects that we are currently working on, we are doing a Car Park for Avenue Recycling in Belfast, we are also working on 8km of water mains for Loughside Transport, while we have completed a number of projects for the DOE here in Northern Ireland. Robert puts their longevity down to the level of service they provide and to the fact that they never got too big, meaning they could keep their overheads down.